Ok, here’s the kind of day it’s been. I’ve been working on a website since 7am and I have not managed to load even one page. I’ve MADE pages, but they refuse to publish. I’m using Weebly, which I used to create the Pisces Rising website a few years ago. I had that site built with pages, subpages and about 300 images in the same time I’ve spent today getting nada. Hopefully Bob can figure something out when he gets home. For now, I’m about over-frazzled trying to figure it out. (BTW, those of you who have looked for the Pisces Rising site, it is gone. They put the domain name in jail and we could not afford to bail it out. Someone in Japan owns it now). I finished this painting yesterday. I do not know any more about it than you do. It started out much more literal but design and early execution problems made the original drawing impossible to render. 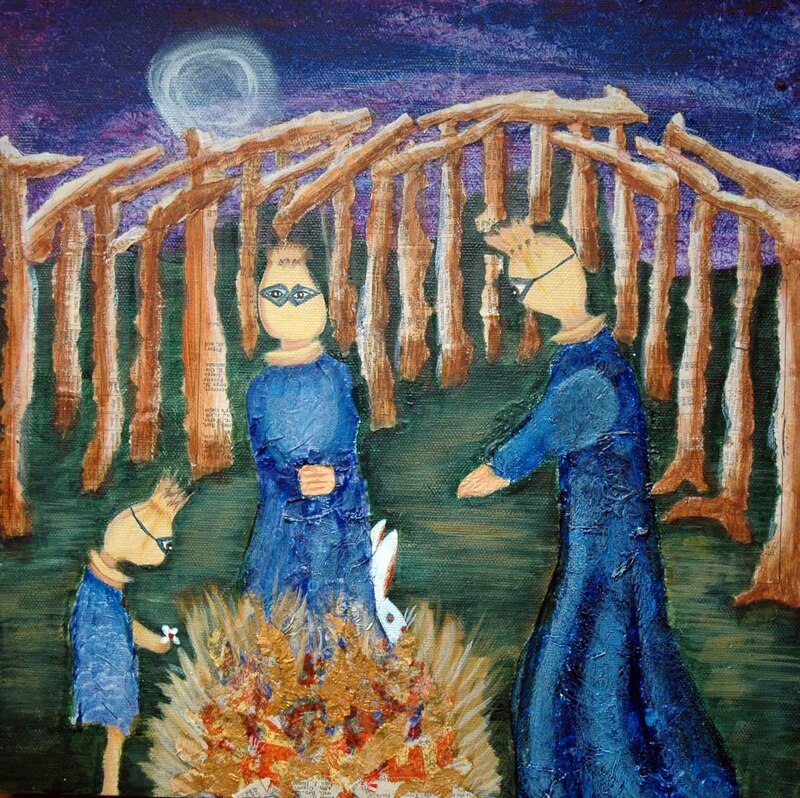 So I added a bonfire, made the rabbit peek around the central figure and the entire grove was added. Really all that came from the original was the figures and moon. As you can easily see, I’ve forgotten just about everything I knew about painting. Much of the work is paper collage–the dresses, bonfire and trees, then over-painted or washed with acrylic. I had the idea for poppy seeds as inspiration for heads, the masks appeared later in the drawing. I think it is mostly an over-spill of all the fairy tales I’ve been reading, listening to Dr. Pinkola-Estes CD’s while painting and some sort of dream. Keep warm! 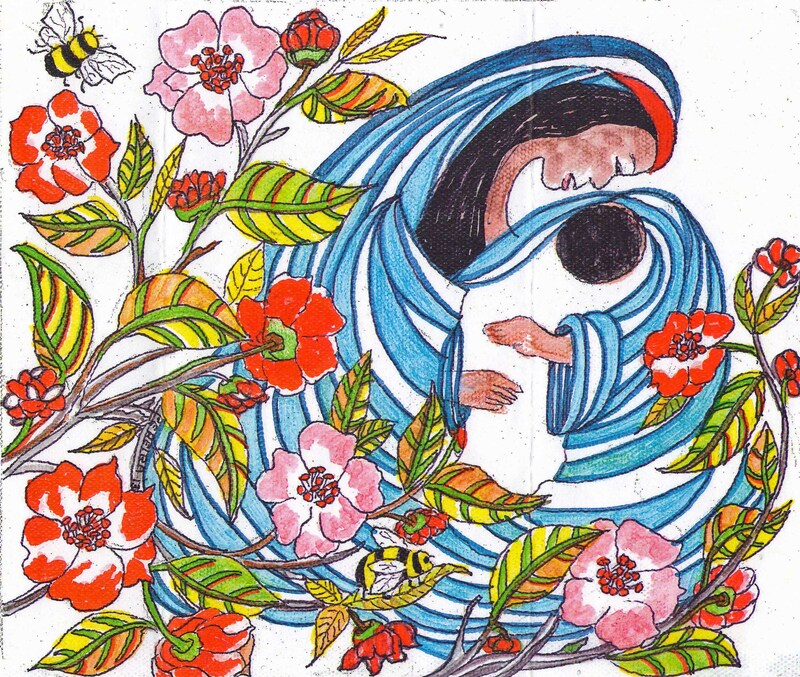 I received this gorgeous Madonna and Child image from my friend, the artist Pereira. I love the Madonna image, and no more so than at this time of year. In this image, I see similarities to two distinct styles, with a mixture that is a refreshing and intriguing POV. These styles are two of my very favorites. My initial thought was to the illuminated manuscripts of the Medieval ages. Obviously the Madonna/Child iconography was common during the Medieval times, but it is more the detailed, botanical renderings of this painting that evoked my response. The illuminated manuscripts illustrated gorgeous flowers, vines, animals and usually the inclusion of insects, notably bees. The detail in the leaves and flowers are characteristic of the period. These elements in combination suggested to me those most reverential religious artworks. The other stylistic reference I see is one of Latin culture and folkloric Mother images. Perhaps the full bloom flora and vibrant colors remind me of Guadeloupe. Maybe it is the invocation of holistic connection between Mother, Child and the natural world that re-minds me of milk from the breast, honey from the hive and the sweet fragrance of flowers. But, the best thing about this piece of art, in my opinion, is the elegant merging of two disparate styles into a distinctive new vision. It is evocative and lush, and it delights me. Brava!